In our last post, we celebrated the latest Google Play Console updates that give developers more visibility into how people organically discover their apps and uncover insights further down the funnel. 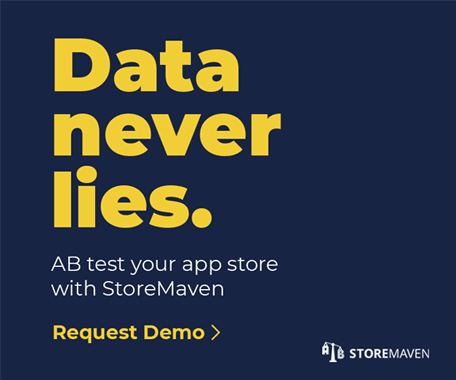 At StoreMaven, we love analyzing this type of data, especially as we assist mobile publishers in measuring the return on investment (ROI) of their App Store Optimization (ASO) efforts. Although the Play Console updates are a major step forward, it’s important to be aware of their limitations and the caveats to consider as you begin to analyze your data. This post will give you a better understanding of the data that’s available and why the Play Console is a strong monitoring tool but not one on which you can fully base your analyses or strategies. Seeing improvements in your metrics is beneficial, but the key to creating long-term, significant impact is understanding how to methodically replicate those improvements. This, as you’ll soon learn, is not information the updated Google Play Console currently provides. As we mentioned in our previous post, the update now enables developers to see a breakdown of “Search” and “Explore” under organic acquisition and also which keywords drive the most traffic, installs, and value to their app or game. This is a significant update since organic traffic was previously grouped together in a single bundle, thus making developers and mobile app marketers blind to the nuanced differences between organic traffic sources. To help guide you through the updates, we created the above table to highlight what’s new in the User Acquisition dashboard. As you can see, for both Retained Installers and Buyers, you can isolate traffic, installs, retention, and buyers/repeat buyers by search and explore traffic sources. Another update to note is that as of July 30th of this year, visitors who saw previews of your Store Listing and/or installed directly from the Search Results Page will now be included in the total number of visitors and installers listed in your Play Console dashboard. On one hand, it reveals the value of optimizing assets that are visible in the search interface since they contribute to your overall performance. From an analytics perspective, however, you can’t isolate the number of impressions or installs coming from the search preview. This means that although you might see an increase in the total numbers of visits and installs, you’re unable to attribute it to the Search Results Page or your full Store Listing. While there are benefits and insights to be drawn from the new data, there are a few drawbacks to keep in mind. In the new keyword search breakdown, Google pulls out your top keywords based on search volume, which provides great insight into which search terms drive the most traffic and installs. 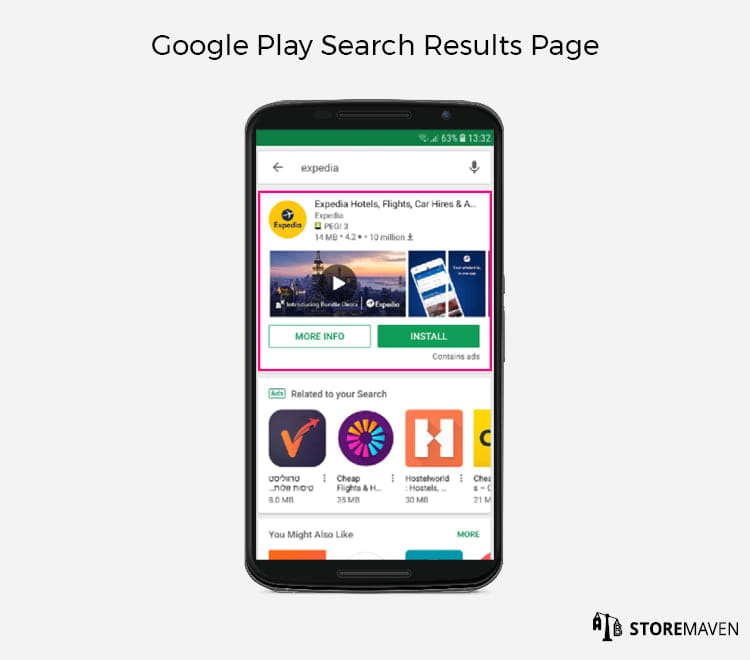 They also have a category called “Other,” which includes all search queries on Google Play with a low volume of Store Listing visitors. It’s important to note that Google determine the search volume cap, so the number of keywords displayed can vary significantly by app. The downside to this new breakdown is that lower performing keywords that could possibly have great potential are hidden in the “Other” category. In the example above, keywords in this category drove about 8% of impressions and 7% of installs for the given time frame, and an effective ASO strategy can greatly increase those numbers. Even though Google display keywords with the highest search volume, there are instances in which you might want to optimize for the lower volume keywords. For example, you might be missing out on identifying keywords that currently have low search volume but have high conversion to buyers and repeat buyers. By optimizing for these keywords, you could expand your reach in a new market and achieve higher return on your app store marketing efforts. In the Play Console update, there is also a lack of country breakdown for keywords and explore/search data. Unless it’s safe to assume that 100% of your traffic comes from one country (which isn’t the case for most developers), then the new data can be misleading. Most apps receive traffic from all over the world, which makes localizing your Store Listing and understanding subtle regional differences and trends an essential component of your mobile marketing strategy. If you only cater to a Tier 1 market or simply one country/language, you’re not taking full advantage of your app’s global distribution potential. In fact, we have an entire post dedicated to the importance and conversion rate (CVR) benefits of localizing your app store page. However, the new Play Console metrics don’t help with localization since you’re unable to isolate the impact of geo-specific efforts (e.g., designing app store creatives based on popular keywords in a specific region). If you couple this with the hidden “Other” keywords, you’re likely blind to localized keywords that could’ve made a large impact in different geos. You can even mistakenly attribute losses in your primary market to certain keywords simply because a negative trend in one major geo potentially moved the needle for the entire world metric. In addition to keywords, there is no country breakdown for explore and search data; you can only see overall organic traffic metrics by country. One of the most important questions companies ask today is: “What is the incremental value of user acquisition (UA) campaigns on organic traffic?” As you begin to address and attempt to answer this question, you need to understand the relationship between UA, search, and explore, instead of just looking at organic traffic as a single entity. For most apps, UA can clearly contribute to higher rankings in the top charts (i.e., explore). For search, unlocking the true k-factor is becoming a major priority as it allows you to become more effective in your overall strategy. But without geo-specific data for each organic traffic source, you can’t determine what’s causing increases or decreases in your overall organic metrics. This compromises the accuracy of these metrics and makes it difficult to replicate success. 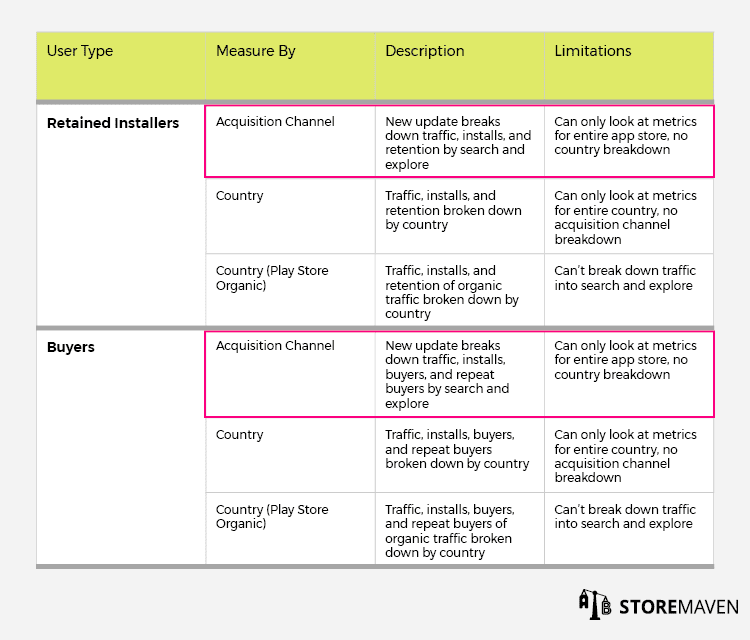 The organic traffic benchmarks listed on the Play Console may also be inaccurate or irrelevant to your analyses since they, too, aren’t broken down by country and combine search and explore. To take it even further, the general lack of transparency and the vagueness around how Google determine these benchmarks makes one question how valuable they truly are. For example, with a global travel brand like Expedia, would it be effective for them to use benchmarks that may also include smaller, indie apps or apps that chose to be under the travel category despite having very different businesses (e.g., currency conversion apps)? If anything, it seems more counterproductive, and at the end of the day, there is no value in retention benchmarks if you’re comparing yourself to non-comparable apps. While there’s more visibility into search keywords and which terms drive the most installs, there’s still an absence of clarity regarding where explore traffic installs come from. 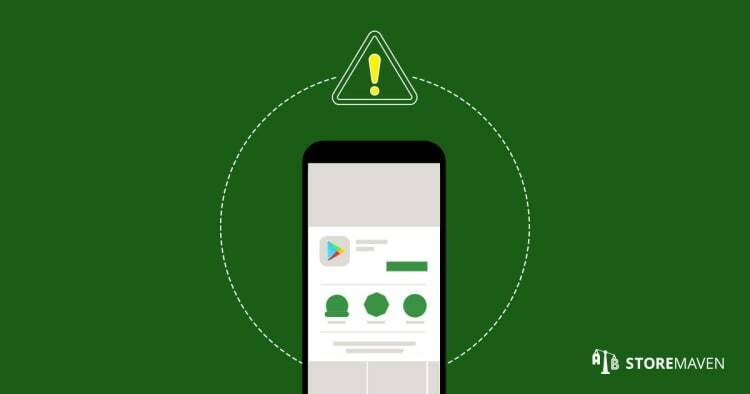 This could be due to the fact that explore traffic is affected heavily by Google’s algorithm, which creates a personalized (and constantly changing) Play Store experience and subsequently impacts the unique app recommendations they offer to each user. Thus, pinpointing a general, overarching explore context is difficult. However, while you can gauge how well your explore traffic is performing overall, the Play Console still doesn’t offer sufficient tools to understand why an increase happened or how to strategically replicate success. But, on that same note, it’s important to remember that app stores are dynamic ecosystems—what works now might not work next month. To develop a strategy, you must constantly test and update your assumptions and hypotheses. As Apple and Google continue to change their algorithms, ranking calculations, etcetera, your strategy must change as well. Overall, the Play Console is a powerful monitoring tool with high-level metrics that give you a sense of where you currently stand and whether you’re in trouble. However, in its current state, the console is not an effective analysis tool. If you’re noticing negative trends or significant decreases across traffic sources, Google doesn’t provide enough information or context to identify what the cause is and to analyze the situation effectively. Ultimately, as you analyze your app store marketing performance, you want insights that help build a long-term strategy. You can’t be satisfied with one-off successes unless you find a way to replicate them. Google are going in the right direction with these organic attribution updates, but there’s still room for improvement in making the Play Console a better analytics platform. Any questions? Feel free to reach out to us at info@storemaven.com.